Shares of BlackBerry manufacturer RIM soared nearly 7% on Friday to close at $14.38 a share. The stock popped on rumors that Korean manufacturer Samsung is planning on making a minority investment in the troubled company. According to the rumors, Samsung will also develop smartphones using RIM's new BlackBerry 10 OS which is expected to launch sometime this year. Collin Gillis, an analyst with BGC Partners who has a "sell" signal on RIM, says that Samsung along with other Android manufacturers, is concerned about what Google has in mind after its purchase of Motorola Mobility is completed. Gillis says that both Samsung's home grown OS bada and Microsoft's Windows 8 could give Samsung some answers if Google changes its licensing strategy for Android. The analyst, who believes that this will be the year that Windows Phone hits the big time, says that talks between Samsung and RIM for the use of BlackBerry 10 OS are likely to have occurred and the speculation is that Samsung will throw $1.5 billion into the shrinking RIM vault. 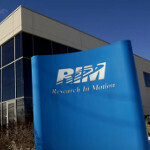 The analyst says that Samsung really doesn't get anything from a minority investment in RIM and the Canadian government has made it clear that they do not want a foreign company to buy out RIM. That leaves the new BlackBerry 10 OS as the reason for Samsung's investment in RIM. Gillis said that he doesn't have a clear time frame as to when we might see Samsung branded BB 10 powered models, but he is not optimistic about BlackBerry making up ground on the competition with the new software. "I could give you a better answer in the fall,” says the analyst, "When we see how much the platform has deteriorated." Gillis adds that having Samsung produce smartphones powered by BlackBerry 10 OS could be a negative for RIM because the Korean firm makes better phones than RIM. Back in January, word leaked that RIM was only building one new smartphone powered by the new OS. If that proves true, it will leave plenty of room for other manufacturers to produce BlackBerry 10 OS flavored phones. 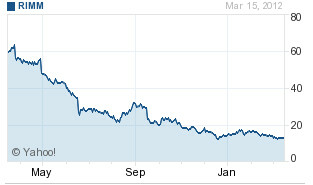 Even with today's rise, RIM's stock is well off the 52 week high of $64.63. O_o hmm SGS3 with BB10 os? would not be a very pretty combo! bt hey anything to save the dying company I know this articles says nothing bout SGS3 but thats the first thing that comes in mind when i think samsung..
Galaxy Line always use Android, if Samsung want to use BB10, then they wont use Galaxy name. If the Canadian government doesn't want any foreign investors buying RIM, we'll.......BAIL THEM OUT!!!! Too late for RIM Blackberry is done...and Samsung should not be panicked...Google has already clarified their stand on keeping Android and Motorola separate. samsung already has some eggs moving into other baskets such as wp and bada… google might promise to keep moto separate but come on, if there was a lion with some meat nearby how trusting would u be that he won't eat it? Still in the long run,if the extra money tipped in by Samsung helps RIMturn out a much better version of BB10 software/phone wise it will be worth it.Something has to happen to refocus the market spotlight on RIM ina positive way. One of the problems with RIM is that their products are always overpriced (at least in my opinion). For example their latest Bold is still $199 on contract with Sprint while many 4g devices that came out around the same period or later are already dropping down to $99. I know, not much of a big deal, but with the Bold 9930, it's still single core processor (which I know still runs smooth for the most part), no front camera, no 4G, etc. They really need to match their prices with their devices. I look forward to their Blackberry 10 devices and hope they will be able to come back. I don't see this year being Microsofts year. They can't even sell WP7 phones let alone talks about W8 phones and tablets. Not saying they aren't good phones but Microsoft still has yet hit a key point that's direct with the consumer. The nokia Lumia series is selling very very well, actually. There is a reason Nokia became the top WP7 manufacturer all of 2 months after they started selling them. What happened to Tizen? Is that still on??? So now it's BB10??? Also, didn't Samsung say no WP this year? How come there are rumors surfacing from different sources saying that the Samsung WP7 Mandel is imminent??? How about Bada, is that on again??? For the top dog Android OEM, it's beginning to look like Samsung is frantically looking for a fallback position with regards to Android. Is there something they know that they're not telling? What shrinking RIM vault ? I said before , I think Samsung is just looking for a backup plan . They have increased investment into Bada , and now they are thinking into diversifying their OS's . So , in case anything happens (negatively) from Google , they aren't left out in the cold . They may call it an investment , but it may also be a down payment to use the BB OS . People forget that most of RIMs money comes from BES subscriptions, not from phone sales. They were not in trouble until they started losing the business market they had locked down. That said, a superphone with samsung hardware and BB10 on it sounds like a winner. It wouldnt need all the best hardware, but a dual core exynos 4212 chip, fat battery, and a SA+ screen would sell that phone like crazy. Samsung phones have the newest technology but aren't reliable, blackberry may not have the newest technology, but they are reliable, durable, and have great battery life. If they mix, then i wouldn't buy a BB10 device. No reliability? I'm sorry but you don't get voted phone of the year by having "no reliability"
I'm speaking from personally experience , 2 of the 2 Samsung phones I've had either had to be retuned for defect or is having hardware problems while my 2009 blackberry curve is still up and running. While I do agree with you about bb hardware, I think your experience with Samsung might be a fluke, I've never personally owned a Samsung I know plenty of people who have owned feature phones, my wife has the sgs2, and I have plenty of friends and family who still rock the sgs1 and none of them have ever had any problems. samsung makes junk!!! unreliable junk! !